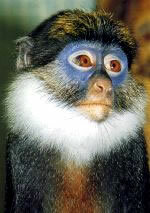 The white-throated guenon is a very rare species found in Nigeria. 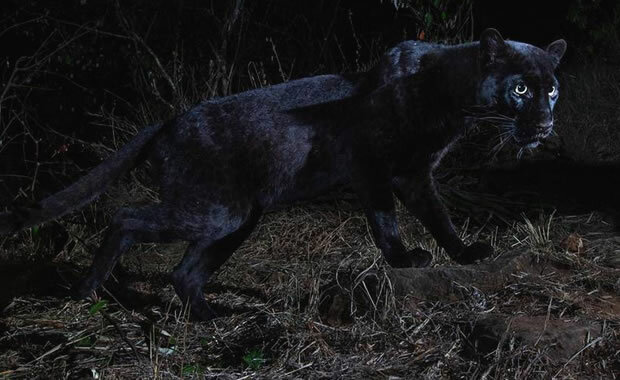 It was once believed to be extinct until a small group was found near the Niger River in 1988. Other populations may survive in Benin. Adults have black fur and weigh from 4.4 to 9.9 lb, and they have rather long tails that reach up to two feet long. The long tail helps them to keep their balance when jumping from tree to tree. Males are larger than females. As its name suggests, this species possesses a white ruff that covers its entire neck, chin and breast. Its cheeks are also covered with light to dark brown fur, and it has sharply contrasting colored skin around the eyes. It is also called the red-bellied guenon because of the red coloration on its underside. This species prefers rainforest and tropical areas for its habitat, but some individuals have been found in secondary bush and old farmland. White-throated guenons are mainly active in the day and prefer to remain in the trees. They prefer to eat fruit, but can also eat insects, leaves, and crops. Like other guenon species, this species possesses cheek pouches that are use to store food while foraging. Males are often seen alone unless during mating, and females and their young live in small groups of four to five. Little is known about the reproductive behavior of this species. Females are known to give birth to only one young. Due to its decreasing population and low reproductive rate, this species may become extinct in the near future. In the past the species was threatened by hunting and habitat destruction for agricultural development and logging. Today, the territory in which the remaining population is found is protected and regarded as holy land, and hunting and logging is now restricted. Copyright Notice: This article is licensed under the GNU Free Documentation License. It uses material from the Wikipedia article "White-throated guenon". Glenn, C. R. 2006. "Earth's Endangered Creatures - White-throated Guenon Facts" (Online). Accessed 4/23/2019 at http://earthsendangered.com/profile.asp?sp=280&ID=1. Need more White-throated Guenon facts?